As other I.N.K. authors have mentioned, there wasn't a great deal of engaging nonfiction for kids in the not-so-distant past. So, we made do. Personally, I gave up on the official children's area of the public library at 8 or 9 and remember wondering if someone would stop me if I dared to enter the adult section. Nobody did, so for years I headed straight for the 636 shelves where all the animal books lived and branched out from there. Until seeing this picture, I had forgotten the rainbow-like arrangement you could make with the binding colors of the LIFE Nature Library. There were 25 volumes in all—a few are missing from this photo. One of the great things about this type of collection is the serendipity...it was like browsing in the library but on a smaller scale. It was comprehensive, covering animal behavior, the poles, the insects, evolution, plants, even the universe! Anyway, time and time again I examined every photograph, drawing, and diagram and read the captions as well as a fair amount of the pontification, ummm, long paragraphs. 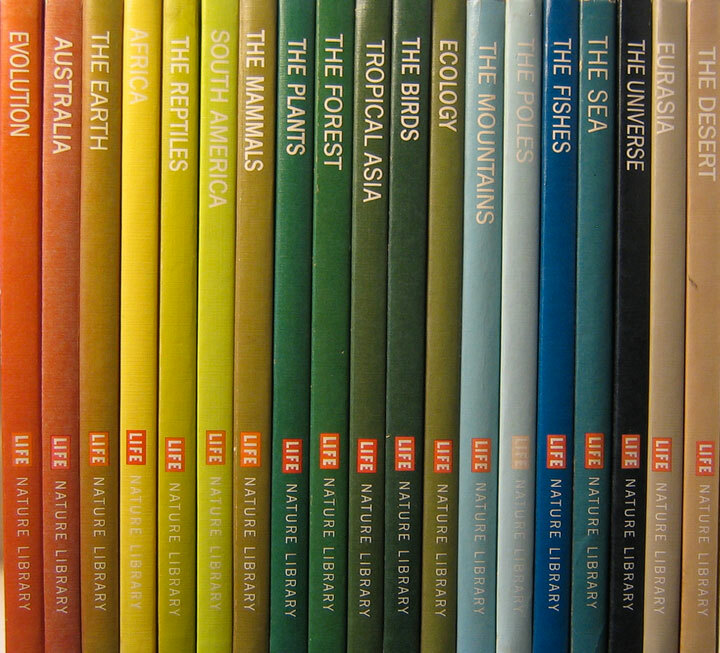 Despite that complaint, the books provided a remarkable breadth of knowledge of the natural world as did our subscription to National Geographic. The photographs from all over the globe inspired many a drawing by providing exotic models that were otherwise unavailable in suburbia in those pre-Internet times. Want to draw an ocelot or an orchid or a young Tuareg girl in the Sahara desert? No problem! To zoom up to the present day, I'm still intrigued by anything to do with nature, past or present. The other night we watched The Hunter, a fictional tale about the last Thylacine (aka the Tasmanian tiger/wolf, actually a carnivorous marsupial). 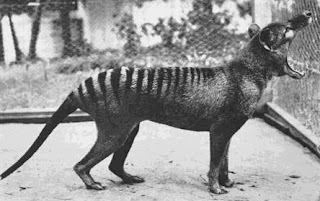 In reading more online about the animal afterwards, I came across this photographic comparison of Thylacine and wolf skulls that show a remarkable example of convergent evolution. Like many of us these days, I do more and more of my knowledge rummaging online, but of course it isn't necessarily very well-organized or presented. Guess that's where authors come in (whew!) Since we're talking about life-changing nonfiction, why not highlight a few books about how life has changed over the eons? In a previous post I made a list of mostly reference books about prehistoric life, from short and sweet to comprehensive in scope. 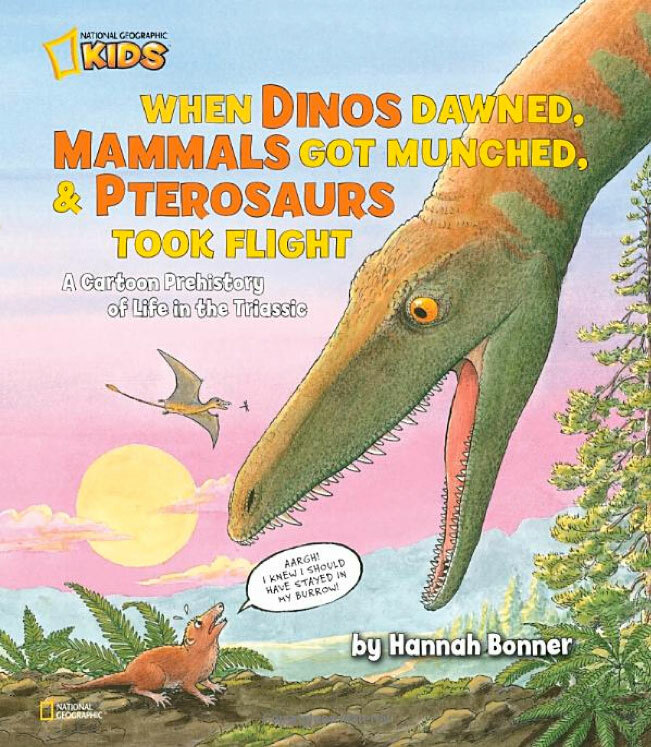 The newest book in Hannah Bonner's prehistory series is about the Triassic period when dinosaurs first emerged along with the first mammals. When Dinos Dawned, Mammals Got Munched, and Pterosaurs Took Flight: A Cartoon Prehistory of Life in the Triassic looks just as fun as her previous two books. In addition to the fascinating animals, she includes many prehistoric plants as well as liberal doses of humor. As a former Mad Magazine junkie, I love a helping of humor and/or satire stirred into my information soup. Her books are great for ages 8-12 (and older, if you ask me) and are published by National Geographic. 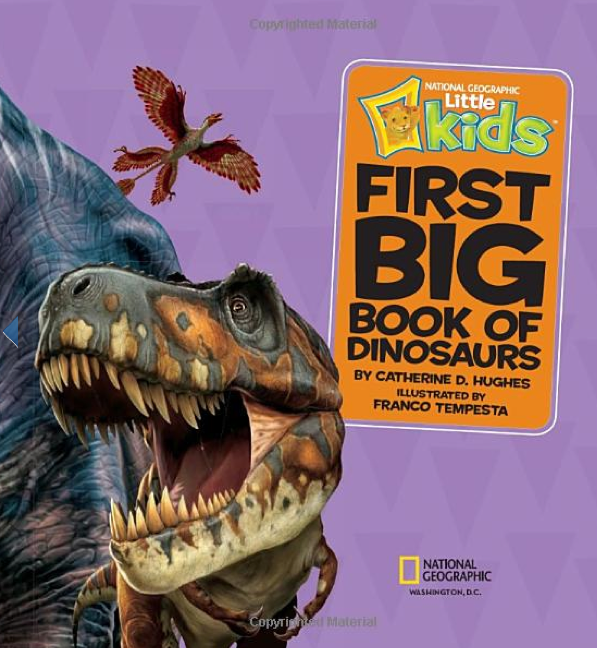 Nat Geo is also the publisher of the Little Kids First Big Book of Dinosaurs, written by Catherine D. Hughes and illustrated by Franco Tempesta. The image shown is not the cover, but I love that little microraptor gliding by. 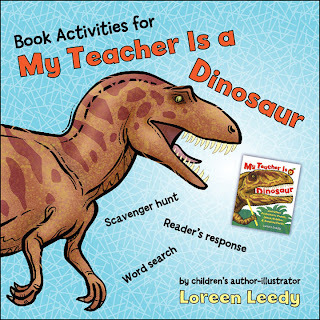 It has a gazillion facts, dino descriptions, fun questions, baby dinos, easy-to-comprehend pronunciations, tips for parents, and outstanding realistic artwork that transports the reader back in time. It is 128 pages and is for ages 4-8. And one of mine is My Teacher is a Dinosaur and Other Prehistoric Poems, Jokes, Riddles, & Amazing Facts. It gives an overview the history of life in 48 pages, starting from the time when Earth was still molten. There are quite a few dinosaurs, but many, many other fabulous creatures including a few humans. 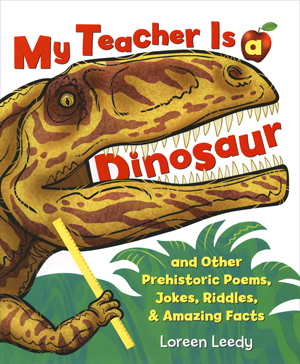 In terms of approach it has some of the elements in common with the two books above...plenty of facts, humor, realistic artwork, and pronunciations of those jaw-breaking names...and also limericks, verses, and silly jokes. Several excerpts are shown in this post on my book blog. The age level is 8 and up. 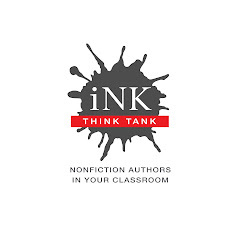 A printable teaching resource with three activities for my book can be downloaded at this link or click the image to the left. 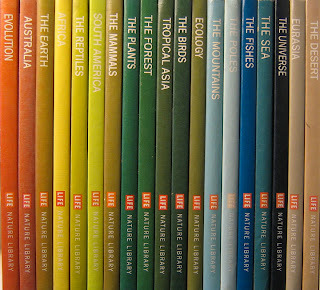 I don't know of any modern equivalent of the LIFE Nature Library with its expansive coverage inside those matching volumes. Most of us compile our libraries piecemeal, which seems to work just fine. In any case, how information is organized and presented is important because different approaches will engage different readers. The prehistoric parallel is that wherever there is rich content for readers, an opportunity may arise to evolve in a new direction. 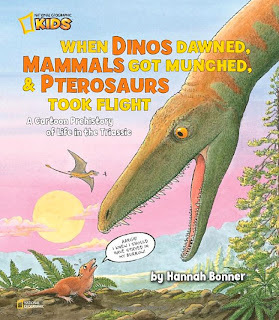 My daughter and I read all three of Hannah Bonner's **Most Wonderful** Prehistory Series as a follow-up to another INK recommendation, Billions of Years, Amazing Changes. They complement each another perfectly; I can't tell you how much I learned! I have to admit I havent read Bonner's books yet but they look very interesting. I loved the Time-Life Nature series, too, but my favorite books were their wonderful This Fabulous Century series. It went decade-by-decade, from the 1900s to the 1970s, and then they added a book for 1870-1900. The visual format inspired by love of history and the style of books I usually write today. The Time Life NF books were my lifeline growing up. I was fascinated by facts and these series wrapped them up in a beautiful package. I have been so pleased with the great trade NF written and published for kids in the last 30 years! Thanks for this post! T. glad you and your daughter found all those good books! Resh, maybe your library has Hannah's books. Sue, I never saw the This Fabulous Century series...sounds inspiring indeed. Marge, aren't we lucky we had access to such great books? Not JUST the facts, ma'am, but YES, the facts!